Pasta pomodorini is one of my favorite pastas. 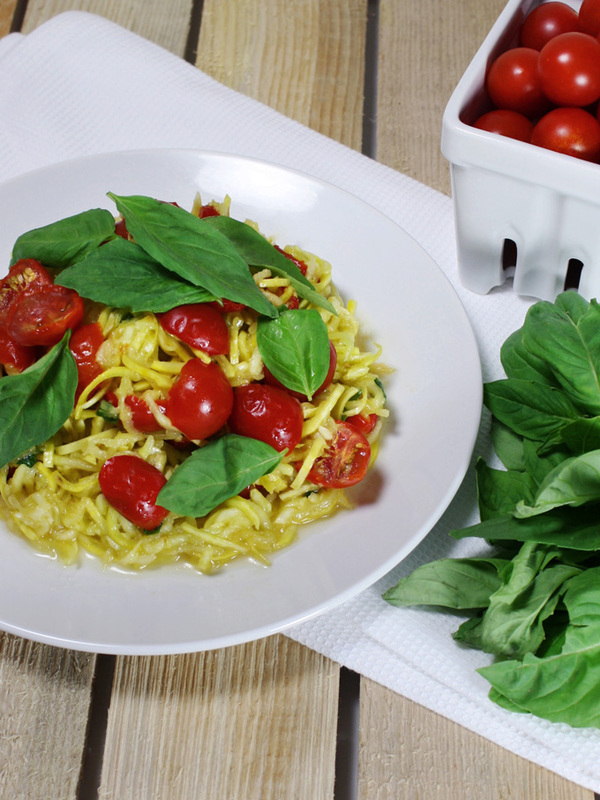 It’s basically cherry tomatoes, olive oil, garlic, and basil sauteed and tossed with spaghetti. Very simple, yet so delicious. To me it’s the epitome of an Italian dish, simple with the purity of the ingredients speaking for itself without any fuss. Perfection! So of course, I had to make a raw vegan pasta pomodorini. I must say, it’s pretty darn good. It’s easy, simple, tasty, and refreshing. You can get it done in 15 minutes, so it’s great for when you don’t want to do a bunch of work in the kitchen. Let’s get started. Cut the cherry tomatoes in half, then put them in a bowl. Add in minced garlic, salt, and olive oil and mix it well. Let it sit for about 10 minutes. If you own a dehydrator, you can dehydrate it too for more of a sauteed texture. Dehydrating will intensify the tomato flavor and soften them just like cooked version. If you choose to dehydrate the cherry tomatoes, lay them out, cut side up on the tray with the silicone liner and dehydrate for about 2 hours at 115℉ (46℃). I like both non-dehydrated and the dehydrated versions. I enjoy the pop of the non-dehydrated, fresh cherry tomatoes as well as the cooked soft texture of the dehydrated version. So the dehydrating is purely optional and up to you. While we are marinating the tomatoes, let’s make the zucchini pasta. If you have a spiralizer like this one from Amazon, it’s really easy to do. Remember, you can get a spiralizer at kitchen equipment stores too! 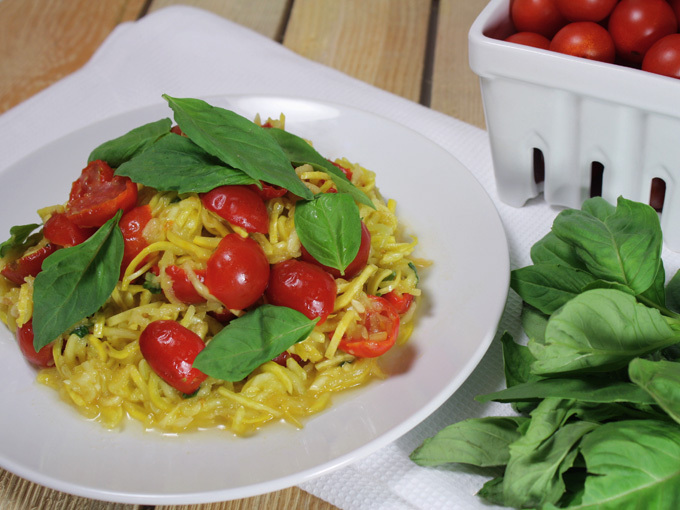 If you don’t have a spiralizer, you can also use a mandolin slicer and make fettuccine like noodles. 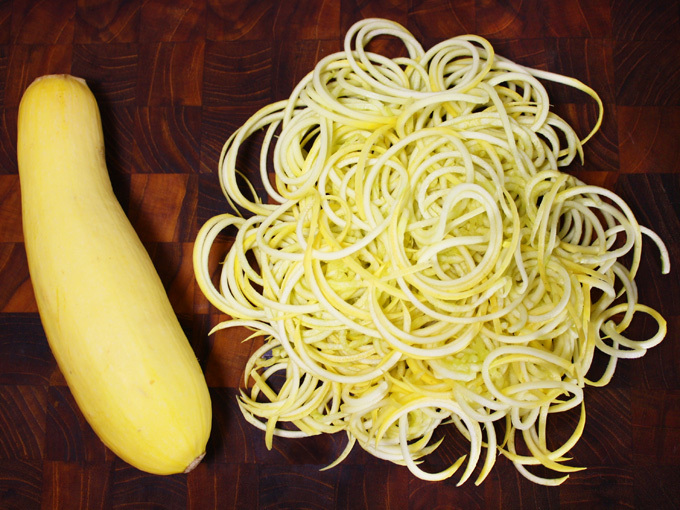 To make the zucchini pasta, chop off the ends of the zucchini before putting it into the spiralizer. Turn the handle until the zucchini turns into zughetti! Magic! Cut through the zughetti a few times to shorten it, so it’s easier to eat. I used yellow zucchini to make it look more like pasta for pictures, but you can use regular green zucchini too. As a matter of fact, I usually use the regular zucchini. Put the zughetti into a bowl. Lightly drizzle some olive oil, and add a pinch of salt. Massage the noodles until they soften, and let them sit for a few minutes. Zucchini will release some water as it sits. 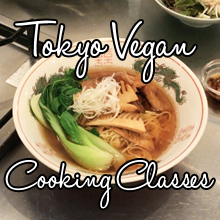 Right before you’re ready to serve, ring out the noodles. Add in the cherry tomatoes and basil, and toss well. Taste test at this point and add salt to taste. If you like it more garlicy, feel free to add more garlic powder. Transfer onto a plate, and garnish with some more basil leaves. You can drizzle more olive oil if you’d like too. Be sure to serve immediately because the zucchini noddles will release more water as they sit. So simple, yet delicious. It’s my go to dish when I want something fast. Enjoy! Cut the cherry tomatoes in half, then put them in a bowl. Add in minced garlic, salt, and olive oil and mix it well. Let it sit for about 10 minutes. Make the zucchini pasta while marinating. If you own a dehydrator, you can dehydrate the cherry tomatoes for more of a sauteed texture. Dehydrating will intensify the tomato flavor and soften them just like cooked version. If you choose to dehydrate the cherry tomatoes, lay out the marinating cherry tomatoes, cut side up on the tray with the silicone liner and dehydrate for about 2 hours at 115℉ (46℃). Start making the zucchini pasta when the dehydration is almost done. Add in the cherry tomatoes and basil to the zucchini pasta and toss well. Taste test and add salt to taste. If you like it more garlicy, feel free to add more garlic powder. Transfer onto a plate, and garnish with some more basil leaves. You can drizzle more olive oil if you'd like. Be sure to serve immediately because the zucchini noddles will release more water as they sit. Dehydrating the cherry tomatoes are purely optional and up to you. I like both non-dehydrated and the dehydrated versions, as I enjoy the pop of the non-dehydrated fresh cherry tomatoes, as well as the cooked soft texture of the dehydrated version. 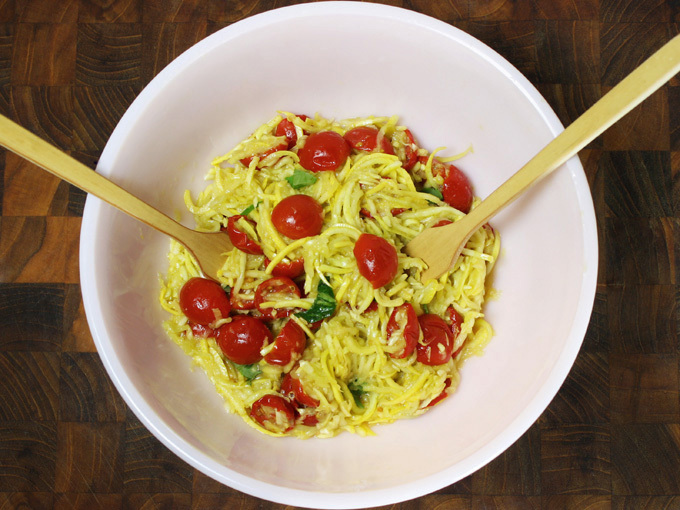 Yellow zucchini is used for zucchini pasta in the pictures, but you can use regular green zucchini.